I've been promising J a Shepherd's Pie dinner for 2 years. Every time the topic of this meal comes up it's invariably 30+ degrees, making it way too hot to sit down to such a winter dish. However, the cold weather has started its descent on Toronto making it the perfect time for Shepherd's Pie. Start by boiling the peeled potatoes in salted water. I always add a dried bay leaf for some additional flavour. Once the potatoes are fork tender, drain the water, remove the bay leaf and let them cool. Using a masher, mash the potatoes. Return the pot to the stove top and add the butter and milk over low heat. Continue to mash the potatoes until they reach a smooth consistency. Let stand. In the meantime heat the olive oil in a large skillet. Once hot, add the ground beef and stir using a spatula to break up the larger pieces of ground beef. Once the beef is browned, add the onions, carrots and celery. Next add the beef stock, Worcestershire sauce, garlic powder, and thyme. Stir and let cook until the vegetables are soft and the liquid is reduced. Add in the corn and peas. Season with salt and pepper to taste. If the mixture is too dry add an additional 1/4 cup of stock and cook for a few more minutes, allowing the liquid to reduce slightly. Pre-heat your oven to 350 degrees. When the beef mixture is cooked, spread it evenly in a greased casserole dish. 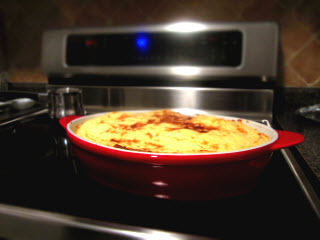 Top with mashed potatoes, and smooth with a spatula. Bake for 30 minutes or until potatoes are golden. Feel free to serve this with a brown gravy for extra flavour!